The College of Architecture and Environmental Design is comprised of a unique blend of five built-environment professional majors that are not found in the same college anywhere else in the United States. We bring together a continuum of all the professions that collaborate in helping society and clients imagine, plan, design, build and operate their regions and buildings. By clustering all these programs in one college, our students can share their educational experiences and studio projects with majors who will later collaborate in the workplace. These five departments constitute the disciplines that affect the quality of our built environment. Their synergy in our college creates a rich learning experience in which students gain specific knowledge and skills related to their chosen discipline, while gaining direct experience with the other fields. Students will also gain understanding about how their future profession integrates into the larger world of environmental design where hundreds of representatives from industries, communities, and government participate even on smaller projects. We strive to prepare all our majors to work globally on innovative teams, that are at the leading edge in creating sustainable, compelling surroundings. All of our programs have high rankings. Major employers hail our graduates as among the best in the nation, citing that they are ready to take on challenges immediately and promote to leadership positions within a short time. As you explore us and get to know us, please read the current Dean's Message to learn about our educational vision, our current student body size and key characteristics. All of our majors are built around educational experiences that are heavily focused on the use of rigorous, time-intensive design studios and project labs as a central arena for the development and integration of multiple skills. The studios and labs are bolstered by a core component of course knowledge in the materials, technology and contemporary challenges of the built environment professions. All our majors place a strong emphasis on the rich tradition of an innovative approach to learn-by-doing within a comprehensive university context. We foster connections with the arts and sciences, humanities and the polytechnic professions. Over the course of your education, you will take classes with other majors and will receive instruction in other departments. As our student, we are committed to providing you access to the classes you need to graduate and those you want to meet your own personal goals. Be sure to look at the whole of the college and the University to get a good sense of the full palette of educational and co-curricular opportunities you will have once you select a major and apply to Cal Poly. Look into the individual department descriptions and links to their more detailed web pages. Many applicants have found that they were not aware of what the different professions do or how they differ. It is our mission to help you find the best fit for your talents and interests. You may select only one major on your application to Cal Poly. We encourage you to compare us to other leading universities to gain a better understanding of what we offer. If you are willing and eager to commit to a professional undergraduate degree with us, you will earn a degree that enables you to become a licensed professional in your field without having to attend graduate school. If you are considering our graduate programs, our emphasis on exposure to leading practitioners and career preparedness will equip you for the theoretical components of your field and the current practices of the profession. Below, you will find brief descriptions of the five departments that make up the College of Architecture and Environmental Design at Cal Poly. The architectural engineering (ARCE) curriculum, one of the most demanding in the University, prepares the student for a professional career in the structural design of buildings. This program is unique in that it goes beyond sound fundamentals of science and mathematics to stress the practical application of interdisciplinary design principles. Through exposure to the other design and construction disciplines, ARCE students develop much-needed abilities for total professional interaction. The program requires skills and aptitudes in mathematics, sciences and deductive thinking. This program affords the student the opportunity to use these rudimentary skills as a basis for the interactive, creative development of a total design concept. Design laboratories are presented in a studio format that emphasizes learn by doing. Theoretical learning is supported by both the intellectual freedom of experimental projects and the discipline of hands-on design problems. The four-year Bachelor of Science in Architectural Engineering program is accredited by the Engineering Accreditation Commission of ABET. Graduates normally become registered as structural engineers. ARCE graduates are among the most sought after in the country with a high record of successful, gainful employment as well as advanced studies. More info on the ARCE department on the About Page. An estimated one in 20 architects in the country are Cal Poly graduates, as are one in five in California. The architecture program is structured to develop and advance the design and technical skills that, coupled with studies in the humanities and communication, prepare students for entry into the profession's vast world of opportunities. As a social art, architecture is a highly regarded profession in America today and there are myriad career choices within its domain. Graduates find success not only in the customary roles for design and construction, but also in fields that vary from media animation to manufacturing and from corporate facility management to ecology. Because opportunities in architecture are multi-faceted, the program is intentionally broad - a rich educational foundation from which to design one's role in today's complex world. No other college offers so much direct exposure to the other disciplines in the planning, design and construction industry. This occurs through interaction and joint projects among and within the CAED's five departments. While holistic in scope, the architecture program offers areas of special focus, culminating in an exit-year project that encourages individuality, specialization and technical expertise. The five-year Bachelor of Architecture degree program is accredited by the National Architectural Accreditation Board (NAAB) and is the first professional degree leading to professional registration as an architect. A Master of Science in Architecture graduate degree program is available for students interested in advanced study in the broad field of architecture and environmental design. A further degree option for graduate study is offered in cooperation with Cal Poly's College of Business - undergraduate architecture students in their fifth year may elect to begin a Master of Business Administration degree. More info on the ARCH department on the About Page. The Master of City and Regional Planning (MCRP) program, through laboratory, lecture and seminar course work, allows students to build upon their individual undergraduate preparation. The program is broadly balanced with emphasis options in either land use and development or environmental and regional planning. The four-year Bachelor of Science in City and Regional Planning (BSCRP) offers unique and excellent preparation in physical planning and urban design with opportunities for individual focus on transportation and infrastructure, economic development, environmental planning, and government and public management. Through projects involving local communities, both programs build from analytic and design foundations, to create practical applications of communication and computer skills. Emphasis is on collaborative teamwork with practical assignments ranging from formulating city-scale plans to the planning and design of precise residential and commercial projects. Faculty academic and professional backgrounds cover a wide range of planning areas with strong academic support from practicing professionals. The department actively participates in interdisciplinary labs which are taught with faculty from the departments of architecture, landscape architecture and construction management in such areas as housing, feasibility studies, community design and sustainable environments. More info on the CRP department on the About Page. Professional constructors work in one of the fastest growing areas of national employment. The construction management (CM) curriculum provides students with the foundation of knowledge and skills necessary to work toward leadership roles in the profession. From the department's central place within the CAED, the faculty integrates architectural, engineering and construction principles required for successful competition in today's national and international construction communities. In addition to basic math and science knowledge and skills, the program initially stresses written and oral communication, natural sciences, social sciences, and the arts and humanities - especially architecture. Throughout the curriculum, construction management stresses theoretical knowledge in both technical and managerial disciplines, current practices and applications of these theoretical principles, disciplined reasoning abilities and excellent communication skills. Interaction with the other CAED disciplines is an invaluable factor in gaining a thorough understanding of the impact that construction has on the physical environment and on human behavior. In addition, interaction fosters an early exposure to mutual respect and cooperation among allied professionals. CM alumni have an impressive record of rising rapidly to success in their professional careers. They are directly involved in shaping the built environment. These achievements clearly attest to the value of the department's graduates. The program's strong curriculum and outstanding students ensure that the needs of industry are met. More info on the CM department on the About Page. 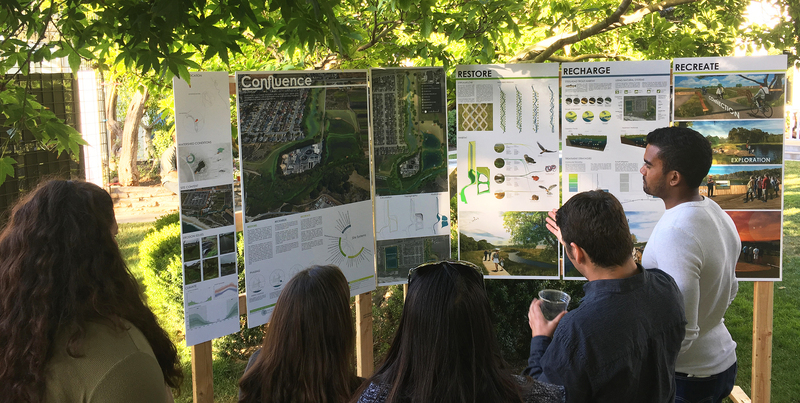 The Landscape Architecture Department prepares students for professional careers dedicated to the design, planning, and management of landscapes essential to the well-being of a healthy society and natural environment. Graduates are workforce ready and have strong foundations in design, sustainable construction technologies, digital representation, and interdisciplinary collaboration. Students develop professional teamwork and interdisciplinary practice skills through team teaching, student teamwork and collaboration with other disciplines within the CAED and Cal Poly. Students develop a global perspective of the profession through opportunities for international study and travel as well as the ongoing integration of multicultural and diverse environmental issues in course work. More info on the LA department on the About Page.